Welcome to the online shop of the Ffestiniog and Welsh Highland Railways. Every penny we make from this shop and from our shops on the railway themselves goes to help build and maintain our world famous, much loved railways. New books available to order now! THE REVIVAL AND RESTORATION of the Welsh Highland Railway is one of the greatest heritage railway achievements of the 21st Century, yet its success followed more than one hundred years of failure. Supported by public loans, its first incarnation combined the moribund North Wales Narrow Gauge Railways, some of the abandoned works of the Portmadoc, Beddgelert & South Snowdon Railway and part of the horse-worked Croesor Tramway. Opened in 1923, it was closed in 1937 and the track was lifted in 1941. Serious talk of revival started in the 1960s but restoration did not start until 1997, with the neighbouring Ffestiniog Railway at the helm, supported by generous donors and benefactors, the Millennium Commission, the Welsh Government and teams of enthusiastic volunteers. Author Peter Johnson steers a course through the railway s complicated pre-history before describing the events, including a court hearing, three public inquiries and a great deal of controversy, leading to the start of services between Caernarfon and Porthmadog in 2011. A postscript describes post-completion developments. This new study of the Ffestiniog Railway's locomotives takes advantage of on-line newspaper records and the recent cataloguing of the Ffestiniog's own archives to produce an authoritative record of not only the technical evolution of the engines but also the lives and interactions of the colourful characters involved with them. Access to the railway's vast collection of photographs, documents, letters and drawings has enabled a highly detailed picture of the history to be drawn. Many of these records are included in the text to help tell the locomotives' story and that of the social history surrounding their evolution and operation. Covered for the first time is the 'business networking' of Victorian railway engineers and its role in the development of the locomotives and their influence on many other lines worldwide. Archive research has also been used to shed light on the lives of those who worked on the footplate. The railway was extensively photographed and this book reproduces the best of those images at a large size, commensurate with their quality. The book covers the period of operation from the earliest horse-drawn days until temporary closure in 1946. This has been done in strictly chronological order, allowing the reader to see when and why key decisions were made. The railway's extensive locomotive maintenance records have been exploited to give a more detailed picture than has previously been published, illustrating the engines' development, operation and decline over the period. 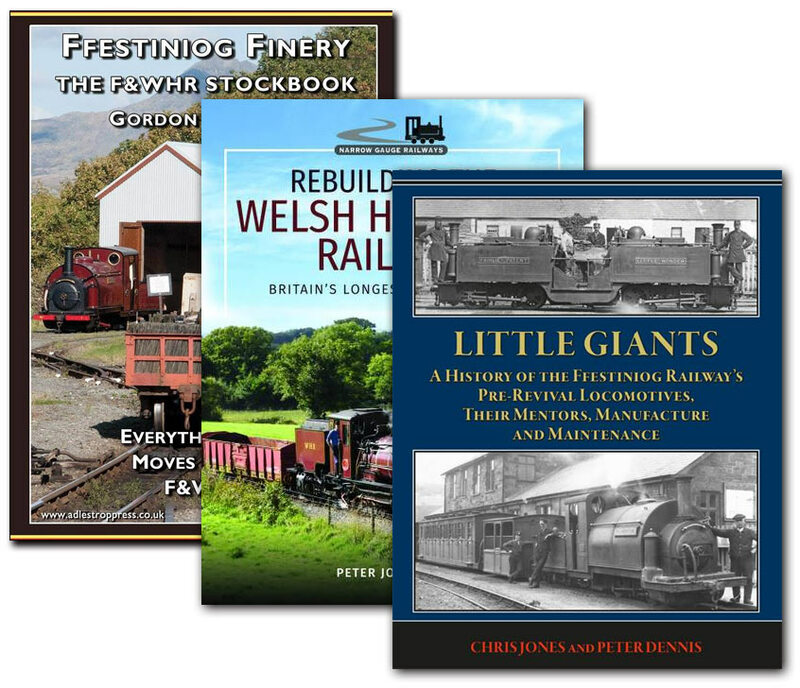 The authors are both long-term volunteers on the railway and members of the Ffestiniog Railway Heritage Group. Peter was also on the permanent staff for fifteen years. With all these and many more products to choose from I hope you will agree that we have something for everyone with a narrow minded interest.